In the mid-1990s, there was a shortage of organic cotton—cotton that Patagonia relied on to make its products. 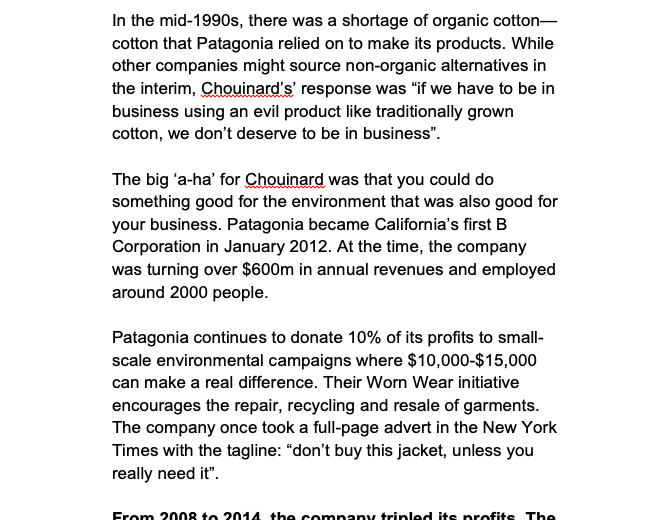 While other companies might source non-organic alternatives in the interim, Chouinard’s’ response was “if we have to be in business using an evil product like traditionally grown cotton, we don’t deserve to be in business”. The big ‘a-ha’ for Chouinard was that you could do something good for the environment that was also good for your business. Patagonia became California’s first B Corporation in January 2012. At the time, the company was turning over $600m in annual revenues and employed around 2000 people. Patagonia continues to donate 10% of its profits to small-scale environmental campaigns where $10,000-$15,000 can make a real difference. Their Worn Wear initiative encourages the repair, recycling and resale of garments. The company once took a full-page advert in the New York Times with the tagline: “don’t buy this jacket, unless you really need it”.